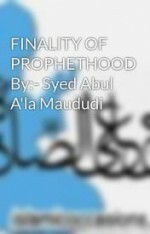 By Syed Abul A'la Maududi (b.1903-d.1979) Foreword (by the author) OF all the conspiracies hatched against Islam in modern times, the most dangerous is a false claim to Prophethood made in the beginning of this century (20th century). (From the Book Seerat Sarwar e Aalamﷺ) God has most graciously provided man with all that he needs in this Universe. Generally, every new-born child arrives in the world endowed with eyes to see, ears to hear, a nose to smell and breathe, hands to touch, feet to walk and a mind to think. All those potentialities, powers and faculties, that a man needs or can need are most carefully provided and marvelously set in his tiny body. Every minute requirement is foreseen and provided for. By Yvonne Ridley Here in Britain the horrific tower block blaze which proved to be the deadliest in London since World War Two is still making front page headlines more than one week after the flames were finally extinguished. (From the Book Seerat Sarwar e Aalamﷺ) We see in big cities that hundreds of factories are running on electricity. Trains and Trams are running. In the evening, immediately thousands of lights are brightened. In summers, fans run in every house. However, these events do not arouse a feeling of awe in us nor do any differences arise among us on the cause of their running and brightening. Why so? (From the Book Seerat Sarwar e Aalamﷺ) THE Lord of creation, the Creator and Sovereign of the entire universe, created man* on earth (which is merely a part of His boundless realm). He also endowed man with understanding, with the ability to distinguish between the good and evil, with the freedom of choice and volition, and with the power to exercise his latent potentialities. In short, Allah bestowed upon man a kind of autonomy and appointed him His vicegerent on earth. The kindness and compassion of Prophet Muhammadﷺ (peace upon him) was such that he commanded ethical principles in events requiring physical fighting. For example: “While entering the enemy area, do not raise your hand against any child, old person, patient or wounded person. Do not raise your eyes towards a woman. Do not cut any fruit-bearing trees. Do not sacrifice any milk-giving animal, and do not ruin a population. WHEN Muhammadﷺﷺ became Prophet, women of that time were deprived of their human rights. They were just a comfort material for men and a source of entertainment. The men kept and treated them as they wished. Men were disappointed and ashamed at the birth of a girl and buried them alive. In the Qur’an, Allah says: “And when the girl [who was] buried alive is asked for what sin she was killed” (81: 8-9). IT is strange that, with all that has been written about Prophet Muhammadﷺ (peace upon him), the world still does not know about the unparalleled personality of the last messenger of Allah and compassionate leader of humanity. Allah has given him the title of “mercy for the two worlds” and has called him gracious and merciful.